Many items were discussed at the July 5th Town Hall Meeting, none as heart wrenching as the story of the bear problem here on Beech Mtn. Much thanks is given to Susan Haberton for providing the information she has worked so diligently to get concerning this issue. For some unknown reason, we have one or more people who have decided to feed the bears! One would think common sense would preclude this practice, especially after information from experts have been provided to those feeding the bears. It is a state violation to feed bears anywhere in North Carolina. However, reports have been received that this practice continues to the point that the town had to enact its own ordinance prohibiting anyone from feeding bears within town limits and assessing a $1000 first offense fine to anyone participating in this practice. Should it continue past this stage, state wildlife officers would be called in and much stiffer fines and/or jail time could result. Beech Mountain existed solely for wild animals and Indians for many generations before it was permanently settled. These animals should be respected and enjoyed 'from a distance'. I know first hand it is well meant to assist in feeding the animals, especially when summer visitors feed the animals, then leave for the winter when the animals need food the most. At the very least, we are contributing to their dependency on humans to provide sustenance; in the worst case, as in the case of feeding bears, we are creating a safety issue for the bears as well as property and humans. Unfortunately, if the state steps in their policy is not to relocate the animals as they feel it is simply transferring the problem elsewhere. To protect the humans that created the problem in the first place would most probably result in the death of the bear, whether adult or cub. There are currently 13 known 'problem' bears created by this unfortunate circumstance. This could result in 13 bears losing their lives because of either misunderstanding or ignorance. Either way, it is a human error which could result in innocent deaths. 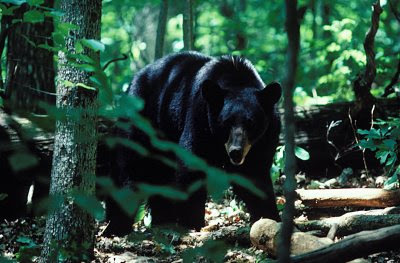 The state website to educate yourself on bears and living in proximity to them is http://www.ncwildlife.org/news_stories/pg00_NewsRelease/042908_Commission_Offers_Tips_for_Dealing_with_Black_Bears.htm. It would be advantageous for each Beech Mountain resident or visitor to educate themselves by reading the invaluable information in this article, as well as other articles on the ncwildlife.org website concerning other animals. Let's all work to co-exist with these beautiful creatures...from a distance and with respect.